Photography is the common language of modern history. It’s everywhere; and everyone, in some way, understands it. This isn’t an emotional outcry of an exhibition, a tragedy-to-triumph aria, which it could easily have been. It’s dramatic, for sure, but in a measured, nuanced, knotty way, like a long, complex sentence with many digressive clauses and a logic sometimes hard to follow. With more than 500 photographs, supplemented by books, magazines, posters and films and spread over two floors, the show can’t help but be overwhelming. But it’s pitched as much to the mind as to the heart. On the one hand, it’s a grand narrative of stirring sights: ardent faces, agitated bodies, camaraderie, clenched fists, funerals. It’s also a disquisition on the ordinariness of good and evil, on how people in a particular time and place encounter and partake of both and go on with their lives, no matter what. Organized by Okwui Enwezor, an adjunct curator at the center, and Rory Bester, a South African art historian, the show is based on the idea that modern South African photography began in 1948, with the legalizing of apartheid — compulsory racial segregation — by a white-led national government. Until then, the story goes, photography had primarily commercial and ethnological uses; after that year it became an issue-specific industry, a political weapon in a civil rights war that went on for more than four decades. The pre-1948 photography in the show has, of course, a political dimension too. 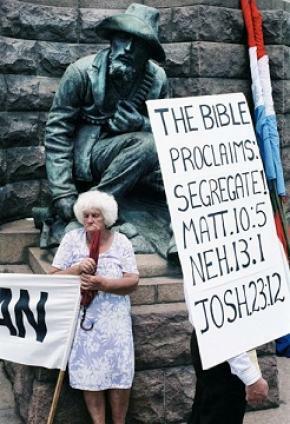 Early in the exhibition we see images of white Afrikaners re-enacting their mythical 17th-century journey from Europe to South Africa, which they claim as their divinely promised land. And although intended to have scientific validity, the carefully posed portrait photographs, some dating to the early 1920s, in A. M. Duggan-Cronin’s 11-volume “Bantu Tribes of South Africa,” likewise combine fact and fantasy. Valuable as field photographs, they also promote a vision of black South Africans as actors in an ethnographic theater, living in a perpetual yesterday. 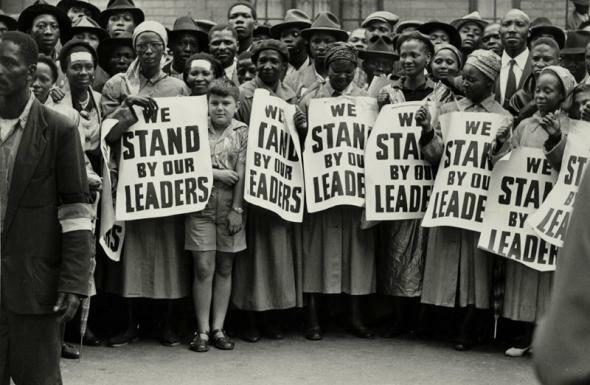 But as this show suggests, theater became an important element in both apartheid-era politics and photography, as in pictures of the Women’s Defense of the Constitution league, known as the Black Sash, in the mid 1950s. A coalition of white women opposed to apartheid, its members staged choreographed protests, standing, impeccably dressed, in silent formation, all wearing identical black sashes over one shoulder. This is how they appear, holding placards on the steps of Johannesburg City Hall, in an enlarged 1956 photo dominating the first floor. They make an unforgettable sight. And while their performance — that’s what it is — may have been directed toward a street audience, it was also calculatedly photogenic. At the time the Black Sash was conceived, organized anti-apartheid activity was based on principles of Gandhian nonviolence. This was not to last. 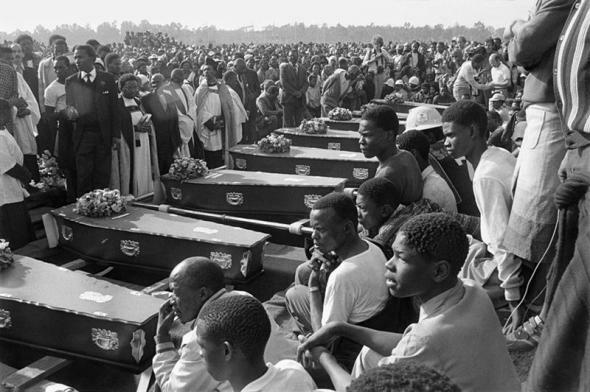 In 1960, at a demonstration against the law requiring blacks to carry identifying passbooks, police killed 69 unarmed black protesters in the township of Sharpeville, 30 miles south of Johannesburg. Everything changed. Nelson Mandela, already a veteran activist, proposed a move to armed struggle. Popular violence erupted. In the dramaturgy of resistance the raised fist became the new symbol of black purpose and solidarity. And photography became the primary means of spreading that gesture wide. In 1976, in Soweto, a black township that is now part of Johannesburg, police opened fire on high school students protesting the enforced use of Afrikaans in their classes. Photographers were there. One of them, Sam Nzima, took a picture of the first person killed, 13-year-old Hector Pieterson, cradled in the arms of a fellow student. 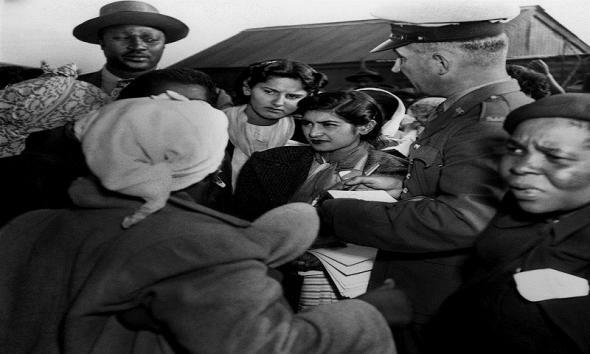 The picture appeared in print the next day, quickly spreading throughout South Africa and beyond it and inflaming anti-apartheid sentiment around the world. 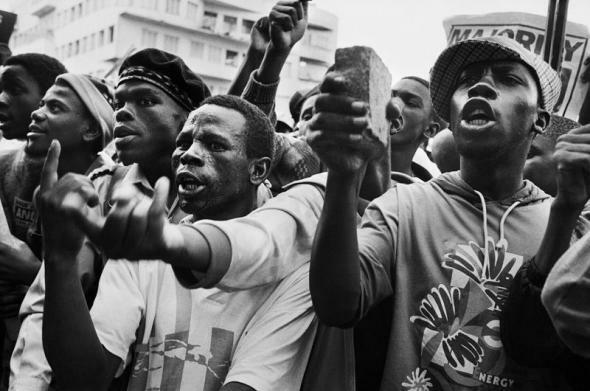 Another photographer, Peter Magubane, was also at the protest, as he had been at countless others since the 1950s. His picture of the mass funeral following the Sharpeville Massacre in 1960 had immense impact at the time; his coverage of the Soweto uprising virtually defined the pictorial genre that came to be called struggle photography. In general the show refrains from designating saints and sinners in the stories it tells. But if there’s a single photographer-hero, Mr. Magubane is it. Time and again he put himself in the line of fire and came away with history. The South African government retaliated. In 1969 he was arrested, placed in solitary for 18 months and banned from using a camera for five years. Other arrests and harassments followed. Not all his images, though, are of combat. From 1960 comes a shot of a young black couple dancing in a Johannesburg nightclub, and one of a tense Miss South Africa, also black, minutes before she won her title. Such pictures represent the flip side of struggle photography, and the show makes a point of emphasizing them — demonstrating that even in conditions of political duress, modern, cosmopolitan black urban life flourished. It was documented in popular magazines like Drum, where, in the 1950s, Mr. Magubane and other great photojournalists — Ernest Cole, Bob Gosani and the German-born Jürgen Schadeberg — got their start. According to Mr. Enwezor and Mr. Bester, however, not all the work in the show qualifies as photojournalism. They cite two other genres. In one, which they call engaged photography, political content is kept oblique, even inaccessible, until the contextual meaning of the image is revealed. A 1993 shot, by the celebrated artist David Goldblatt, of a leafy bush by the side of a road could be of any bush anywhere, until you read the caption and learn that you’re looking at a remnant, preserved in a botanical garden in Cape Town, of a bramble hedge planted in 1660 by South Africa’s first Dutch settlers specifically to separate themselves from the indigenous population. Social documentary forms the next category, exemplified by work produced, beginning in the 1980s, by the multiracial collective agency Afrapix. Afrapix photographers — among them Lesley Lawson, Chris Ledochowski, Santu Mofokeng, Guy Tillim and Paul Weinberg — tended to concentrate on politically driven series of images rather than going after single, emotionally punchy, frontline news shots. Afrapix expanded in the bloody years leading up to the release of Nelson Mandela from prison in 1990. Two years later it dissolved, partly as result of internal conflict but also because financing for anti-apartheid initiatives decreased. Technically the struggle was over. With Mr. Mandela’s election as president on the horizon, optimism, not criticism, was the preferred tone of the day. If this show had been done 20 years ago, it might have ended on an upbeat note. But enough time has passed for realism, if not quite disillusionment, to set in. Significantly Mr. Mandela’s 1994 election passes without fanfare; just a few images in a small gallery. Within the densely layered, winding panorama the curators have laid out, it’s just another event in the story of a country still suffering the long-term effects of institutionalized racism. Poverty is rife. Class privilege thrives. Conflict, interracial and black-on-black, simmers, flaring up hideously last month when the police killed striking workers at a platinum mine some 70 miles away from Johannesburg. What’s left for photography at present, it seems, are backward looks and disappointments. At least that’s what the show’s younger photographers, Sabelo Mlangeni and Thabiso Sekgala, both born in the 1980s, focus on. Mr. Mlangeni shoots half-empty cities and their listless, probably jobless residents. Mr. Sekgala turns his eye on crumbling homelands, apartheid-created settlements meant to confine and isolate blacks. In the past they were places to escape from; in a rootless present they’re viewed with nostalgia. Over all, these are disheartening visions of everyday life. They are part, however, of a far-from-everyday exhibition. It’s not a smooth and easy read. Its direction can be confusing; some of its images are underexplained, some of its themes are overwritten. But the material brought together is rich, its arrangements provocative and its ideas morally probing. In short, it’s really something to see, and I urge you to.